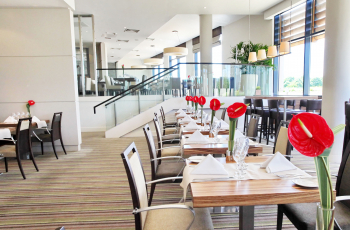 The stylish 2 AA Rosette Caprice Restaurant & Terrace is the epitome of fine dining, offering some of the finest freshly prepared modern British and Asian cuisine in the area. Striking colours and refreshing interior design greet you on arrival, and the talented head chef will surprise you with his delightful creations. Guests are spoiled for choice, with a seasonal à la carte menu featuring the finest local ingredients, and a set menu from £24.95. You really must leave space for the exceptional desserts. There are even pâtissiers who prepare an array of tempting treats – well worth the extra calories. The Caprice Terrace provides the opportunity for relaxed outdoor dining. Prefer something a bit more informal? Try the stunning Monty’s Lounge Bar. Choose from a selection of light bites and quality bar meals, including popular and authentic Indian specialities. If you’re after a quick, value-for-money breakfast or lunch, try Monty’s daily specials or the express lunch menu. The afternoon high teas are also highly recommended. The hotel is transformed at night, with music from the talented resident Pianist. There is complimentary wifi and secure parking. Non-residents are always welcome.